A whole new year. What are we going to do to make ourselves better people this year? Let’s not focus on the things that deal with vanity, let’s consider doing something that improves our relationships with people. The best advice I ever got was to treat people the way you want to be treated and you’ll go a long ways to being a good person. Let’s focus on finding humor in things that we can’t change. Like watching your grandchild throw aside that expensive gift and play with the box it came in. Come one, you should have known that would happen. Quite worrying about the cost and smile that the kid is having so much fun. Let’s focus on letting go of material things that have a hold on us. Choose to own items, not have them own you. Go through your closet and box up that stuff you never wear, never use and either toss it or give it to someone. Being a hoarder is not a good goal to have. Let’s focus on joy in our lives. Make it a weekly practice to do something nice for someone without telling them you did it. Take out their trash, clean up a mess, send them a nice card, order pizza to be delivered to them (and be sure you pay for it). Let’s focus on focus. Set aside twenty minutes each day to catch your breath. Make yourself a cup of tea, put your feet up, and don’t answer the phone. Take a breather and you’ll be surprised at how much energy and happiness come with being content. This is a year that will be what we make of it. Some are starting their first New Year without a loved one that has recently passed, some are starting their first New Year with a whole new relationship, some are starting the New Year with sickness … but we can all start the New Year with hope and faith in the goodness of man. And we can live up to that faith. 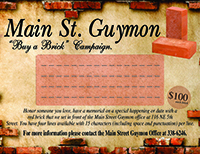 Looking forward to seeing you on the bricks.